The Energy Don's Blog: Total won't drill in the Arctic...because a spill may damage its image! Total won't drill in the Arctic...because a spill may damage its image! Energy companies should not drill for crude in Arctic waters, marking the first time an oil major has publicly spoken out against offshore oil exploration in the region. Christophe de Margerie, Total’s chief executive, told the Financial Times the risk of an oil spill in such an environmentally sensitive area was simply too high. “Oil on Greenland would be a disaster,” he said in an interview. “A leak would do too much damage to the image of the company”. Of course it's worse than than that. A Macondo-style spill might kill some wildlife, or pollute a few ice floes, but successful drilling could be even worse for the environment. If there really are billions of barrels of oil locked away under the Arctic Ocean or the Barents Sea, releasing it to the market would add many more millions of tonnes of carbon dioxide. And in turn that could lead to catastrophic climate change that could affect wildlife across the globe, not just around Total's rig. Am I being too harsh on Total? Probably not, although the other big oil companies are equally culpable. True Shell has suspended drilling for this year due to environmental concerns and it did seem slightly less concerned about its image, but not before it has spent a reported US$4.5 billion: I suspect that they won't abandon the Arctic after making that investment in it. So is there an alternative? Well, conservation - energy efficiency and investment in better public transport - has to be the starting point for reducing demand, with alternative fuels still worthy of consideration. There have been some interesting developments in algae-based biofuels recently, and I may blog on those in the near future. Or we could look instead at trying to capture solar energy to generate electricity, which can drive land vehicles directly, or through creating hydrogen from electrolysis of water. 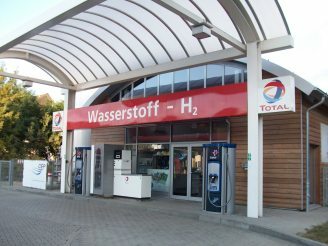 And here Total may get a small plaudit from me, as they have at least one public hydrogen refuelling station in Berlin, in partnership with Norway's Statoil.